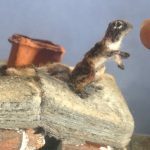 This work by Veronica Verkley, reads as a time-lapse shot over several years, but in reality, it is a stop motion animation shot over many months, with the ruin and decay painstakingly animated by hand. From destruction, there emerges a transformative beauty: the house becomes uninhabitable to some, but in its decay, it becomes refuge for others. 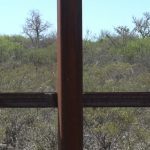 ‘A Very Long Line’ is a four-channel video installation that employs the image and idea of the fence demarcating the U.S.-Mexico border between Douglas, Arizona and Agua Prieta, Sonora. Camera pans of the Sonoran Desert shot through the border fence blur past viewers on all sides, at varying speeds, amid a jarring, dissonant soundtrack composed by the artists. 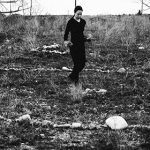 The artistic practice of Mary Anne Barkhouse is deeply engaged with environmental and indigenous issues and incorporates in a central role a visual iconography of animals. 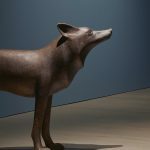 Barkhouse situates her work between the two worlds of the human and the natural and employs the beaver, raven, wolf, and coyote as symbols of the ability to adapt, persist, regenerate, and repair throughout endless environmental incursions. Her skilled handling of traditional sculptural materials such as wood, bronze, porcelain, metal, and glass bring both a refined sensibility and serious tone to her often-playful installations. The works reflect on our skewed experience of nature as a resource for human needs rather than as an ecosystem with its own intrinsic value. This Project Space exhibition is a rotating presentation of works produced in response to the Making Treaty 7 Cultural Society’s Common Ground Dinner Series. Based on the Making Treaty 7 methodology, this dinner series explored the theme of The Land through eight sub-themes: Energy, Agriculture, Education, Law, Culture, Borders, Safety and Security, and Medicine. Jason de Haan: Oh for eyes! At night we dream of eyes! Calgary-based artist Jason de Haan has developed an interest in proposing and undertaking projects in which particular environments, natural conditions, and massive time scales complete, animate, and determine his multidisciplinary practice. The work most clearly deals with fleetingness, vulnerability, and the fragility of the natural world in a way that considers the limits of human perception and influence. The tangible traces of the monumental passage of time, like the interval it takes light from the most distant stars in our galaxy to reach earth – a staggering 3.8 billion years – or the polishing of a stone from thousands of years of touch, are evidence that we are merely a twinkle in a larger and longer conversation. The second film of Anton Vidokle’s trilogy on Russian cosmism looks at the poetic dimension of solar cosmology of Soviet biophysicist, Alexander Chizhevsky. Shot in Kazakhstan, where Chizhevsky was imprisoned and later exiled, the film introduces Сhizhevsky’s research into the impact of solar emissions on human sociology, psychology, politics and economics in the form of wars, revolutions, epidemics and other upheavals. The Communist Revolution Was Caused By The Sun aligns the life of post-soviet rural residents and the futurological projects of Russian cosmism to emphasize that the goal of the early Soviet breakthroughs aimed at the conquest of outer space was not so much technical acceleration, but the common cause of humankind in their struggle against limitations of earthly life. ‘Night Comes On’ is a video installation comprised of sixty 8” LED screens housed in and among ninety-nine black wooden boxes. Each screen contains a looping video depicting human activity within a domestic window frame, as seen from the exterior of a building. The source footage used for this work came from wide shots of glassy apartment buildings in downtown Vancouver, shot at night during a firework festival, which prompted many residents to peer out of their windows. Arranged in the exhibition space, the stacks of screens and boxes reference an active urbanscape environment – a city in motion. Estranged Setting presents two sculptures in an immersive painted environment. The works, Bird Factory (2016) and Trawl (2015), depict shifting anatomies that embody the complexities of contemporary consumption, industrial fishing, and agriculture. In Bird Factory, poultry populate a structure whose appearance hovers between that of a chicken’s body and an industrial farming complex. Cartoonish at a glance, the work plays with pop representations of the animal as a façade for the darker nature of its life within the food production system. Earthlings is an exhibition of visionary ceramic sculpture and works on paper, produced both individually and collaboratively, by seven contemporary artists. Otherworldly, surreal, magically figurative, and underpinned by complex narratives, the works in this exhibition are the products of a range of deeply personal practices that are informed by idiosyncratic realities and myths, real and imagined spaces, sensuality, and spirituality. Ashoona (Cape Dorset), Boyle (Toronto), and the ceramic artists of Matchbox studio in Rankin Inlet share a handcrafted, intuitive approach to transformative imagery that is as sympathetic as it is culturally distinct. The exhibition will feature recent and landmark works by each artist as well as collaborative explorations, including sculptures produced in September 2016 by Pierre Aupilardjuk, Shary Boyle, and John Kurok while in residence at the extraordinary Medalta in Medicine Hat.